Live coverage of the men's time trial at the Olympic Games, taking place on a hilly 54.6km course. 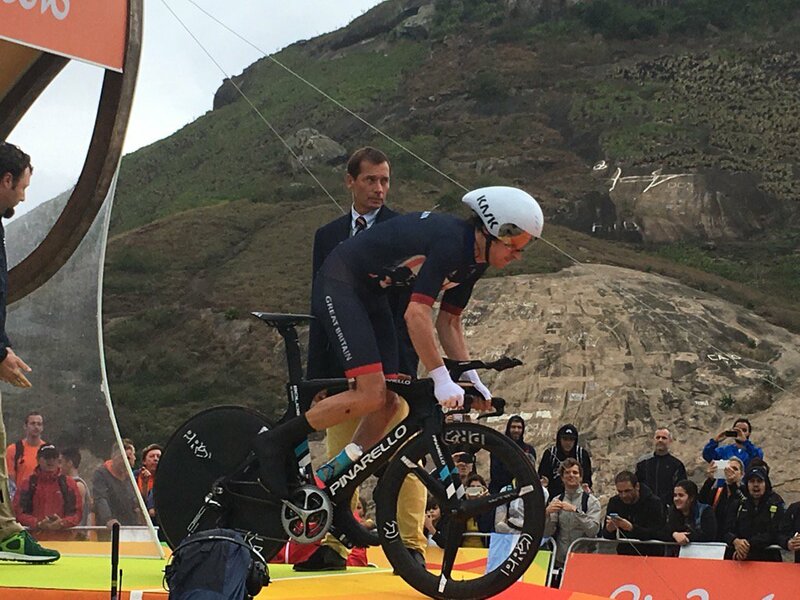 Hello there and welcome to our live coverage of the men's time trial at the Olympic Games in Rio. We've just had the women's race and it's straight into the men's event. Bearded Namibian Dan Craven was the first rider off the start ramp and he's a couple of minutes into his ride. He's using a normal Cannondale road bike - no aero bars, disc wheels, nothing. The course is 54.6km long and is based on the Grumari circuit that was used for the road race. The loop will be covered twice, with two pretty stiff climbs per lap. Mercifully, there's no pavé, with the organisers placing a tarmac section alongside. Early starters Youcef Reguigui (Algeria), Ahmet Orken (Turkey), Ghader Mizbani Iranagh (Islamic Republic of Iran), Mouhssine Lahsaini (Morocco), and Yonathan Monsalve (Venezuela) have all set out and are on the early kilometres of the course. As we await the first time checks, more riders are heading out onto the course. They're setting off at one or two minute intervals. Eduardo Sepulveda (Argentina) could put in a good display here, while France's Alexis Vuillermoz and Ukraine's Andriy Grivko are the latest off the ramp. The rain that fell during the women's race has cleared, though it is still windy out there. The roads are still wet but they may dry up as the race goes on, which would favour the late starters. Dan Craven hits the first time check after 10km and posts a time of 18:09.45. There's our first benchmark. Crash! Nightmare start to the time trial for American Brent Bookwalter, who rolls off the ramps and comes down on the very first corner. That bend is cobbled, and it looked like Bookwalter just touched the breaks, which caused him to slip. He's back up and running, but with a tear to his skinsuit and a dent to his pride and chances of a medal. Ghader Mizbani Iranagh (Iran) comes through the first checkpoint and puts just over half a minute into Craven's time. A bit of detail on the course courtesy of my colleague Sadhbh O'Shea. After a few uncategorised lumps, the first climb to Grumari comes after just over nine kilometres. The Grumari ascent is short, at just 1.3km, but exceptionally steep with gradients reaching almost 18 per cent at some points and will have some riders on their limits very early on. The worst sections are smack in the middle, with a gradual lead-up that belies what comes after it. The run down from the top is equally as steep and technical to boot, with some tight turns to keep the riders on their toes. Between the two climbs is a seven-kilometre flat run with a few 90-degree corners. Grota Funda, the second of the two ascents, is longer but packs much less of a bite than its predecessor. Averaging 6.8 per cent over 2.1 kilometres, it bounces between six and nine per cent for most of the climb. The descent is also a little easier, but a long sweeping right-hand corner could catch some out. From the bottom, the drive to the line is close to eight kilometres. You can find Sadhbh's full preview by clicking here. Some big names starting to roll out now, with Michal Kwiatkowski (Poland), and Leopold Konig (Czech). Belgium's Tim Wellens is next off and that means the first half of the field is out on the course. There will now be a break of around 45 minutes before the second half of the field start their time trials. The fastest split at the 10km checkpoint is constantly being broken here. Sepulveda had it for a short while, but Chris Juul Jenson (Denmark) was quicker, while Austria's Georg Preidler has just set the quickest time with 15:50.92. Kwiatkowski is ten minutes or so into his ride and is making his way along the thin stretch of tarmac beside the that cobbled section along the coast. We'll wait for his time at the first check but the Pole could do well on a course like this. Grivko catches and passes Vuillermoz, who's not looking very good at all out there. Kwiatkowski sets the second fastest time at that first checkpoint (10km) and he now starts this tricky descent which Konig is taking extremely shakily. Tim Wellens is looking strong as he clocks the quickest time at the first check. 15:45.56 is the time, which is five seconds faster than Preidler. The second checkpoint comes after 19.7km and Preidler has set the fastest time there so far - 30:05.26. It's raining again out there and that will make these descents even more treacherous. Georg Preidler needs a bloody rest. This is his 80th race day this year. Kwiatkowski puts eight seconds into Preidler between the first two splits, setting the fastest time now after 19.7km. Wellens is on his way. The third checkpoint is in exactly the same position as the first - around 10km into the loop, with riders now on the second lap. It comes after a total of 34.6km and it's Preidler who once again posts the strongest time with 50:54.46. Simon Geschke (Germany) is flying along now and sets the fastest time at the third check. He put over 20 seconds into Preidler in the space of those 15km. The waiting game. Tom Dumoulin is one of the big favourites for today, but how will he fare with his broken wrist? Geschke flies past Vuillermoz - the second rider to do so. The Frenchman tries to latch onto the slipstream but to no avail. He set off three minutes before Geschke. It's time for the second half of the field. Edvald Boasson Hagen (Norway) rolls down the ramp. Leopold Konig is going from strength to strength now and it's the Czech rider who holds the fastest time at the third checkpoint (34.6km). He sets 50:35.32. Geraint Thomas, another late inclusion, is the next rider off the ramp. The Welshman was able to enter this time trial after the withdrawals of the likes of Vincenzo NIbali and Richie Porte, who crashed and broke bones in the road race on Saturday. Thomas also crashed on that final descent and although he wasn't badly injured, he suffered the huge disappointment of losing the chance to go for a medal after being in a great position. Primoz Roglic (Slovenia) gets going now and could he be a dark horse for today? The former ski jumper won the rolling time trial at this year's Giro d'Italia, let's not forget. Froome, Dumoulin, and the other favourites are going through their final warm-up routines. Here's Ion Izaguirre warming up with Jonathan Castroviejo, who's already out on the course. Izaguirre is a really strong time triallist, the Spanish national champion no less, who won the ITT at the Tour de Suisse this year. He also won the penultimate stage of the Tour de France to Morzine, so a true all-rounder. We have our first finishers. Ghader Mizbani Iranagh (Iran) is first over the line, clocking 1:21:39.45. Craven, who set off first, is six minutes slower. Georg Preidler is sitting in the hotseat as he crosses the finish line to post a time of 1:16:02.36. But here comes Geschke, and he's a good 12 seconds faster. The German is the new leader in the clubhouse. Fabian Cancellara is off now. The Swiss rider was Olympic champion in 2008 and has been a giant of time trialling over the course of his illustrious career. This is his final season - time for one last crowning glory? Rohan Dennis, Izaguirre, and Phinney all out there as Tony Martin, a three-time world time trial champion, sets off. Geraint Thomas sets the fastest time at the first checkpoint (10km) and he's absolutely smashed the previous benchmark, going 27 seconds quicker than Wellens. The current world champion Vasil Kiryienka rolls off the ramp now. A real threat today, the Belarussian. Now for Tom Dumoulin. The Dutchman was the absolute favourite for this time trial - until he broke his wrist at the Tour de France. Now there are question marks over how he'll handle his bike. Will he be at his best? Time to find out. Chris Froome breathes heavily as he waits for his countdown - he's now probably the favourite given Dumoulin's wrist, and he put in two brilliant time trials at the Tour de France last month. What can he do here? Leopold Konig has crossed the line with a really strong time of 1:15:23.64 - the fastest so far. Kwiatkowski finishes now half a minute slower to take third provisionally. Geraint Thomas catches his 1 1/2 minute man, Hugo Houle. The Briton's having a great ride so far. His next time check will come in five minutes or so. Wellens continues to fade in the last part of the course and sets the seventh best time so far at the finish line. Here's how the leaderboard looks at the finish line with all the first half of the field having finished. Rohan Dennis looking mightily strong here as he goes 5 seconds quicker than Thomas at the first checkpoint (10km). Castroviejo, Izaguirre, and Roglic all with strong times, too. We await the real big favourites like Cancellara, Martin, Dumoulin, and Froome. Fabian Cancellara is the next across the first checkpoint and he beats Dennis' time by a sliver. The Swiss rider isn't the strongest climber but he's clearly feeling good out there at the moment, and there aren't many who'll go faster than him on the descents. Tony Martin is 16 seconds down on Cancellara at the first checkpoint. There have been question marks over the German's form recently and he has work to do from here on in. Jonathan Castroviejo has really found his rhythm out there as he sets the fastest time at the second time check (19.7km). He has put 20 seconds into Thomas between those two splits. Kiryienka loses time, around 30 seconds of it compared to Cancellara. Dumoulin now, and the Dutchman is almost 15 seconds down on Cancellara - and the toughest part of the course for him, the descent, is coming up now. Here comes Froome and he's a picture of focus but he's certainly not the fastest. He's seventh fastest - almost 20 seconds slower than Cancellara. Work to do for the Tour de France champion. Here is the top 10 at the first checkpoint (10km) with all riders now through it. Rohan Dennis has a decent descent and is now doing the damage on the flat. The former Hour Record champion is the fastest so far at the second checkpoint (19.7km) but Castroviejo is still going really well. Not good news for Cancellara fans: The 2008 champion has lost considerable ground between the first and second checkpoints - almost 25 seconds compared to Rohan Dennis. Cancellara is in third so far at that second split, with more riders to come. Cancellara grimaces as he gets back on the aero bars. Did he set off to eagerly? It's still early days, and a lot can change with 35km still to race. Cancellara catches Taylor Phinney, so the American is not on a good day, having set off 1:30 before the Swiss rider. Not a good day, either, for world champion Kiryienka, who is over a minute down at the second checkpoint. While others are fading, Dumoulin holds steady to post the second fastest time, but he's now 16 seconds behind Dennis. Froome is next in, and he's also losing time. He's good enough for fifth at this point. Times to follow. There's no rain out on the course at the moment and the roads are drying out but there are still wet patches. Rohan, absolutely drilling it. Impressive. He tends to fade a bit in final 10-15 minutes, but may have a big enough advantage; won't matter. Dumoulin has such great form on a TT bike and it doesn't look like his wrist is affecting that too much today. Castroviejo continues to show his strength here. The Spaniard is a two-time national time trial champion but hasn't won anything longer than a prologue aside from that. There's still a long way to go but he's a medal contender the way things are going. Dennis is on the climb again as he comes up to the checkpoint once more. This is the third checkpoint (34.6), and he is still 20-odd seconds up on Castroviejo. Geraint Thomas is almost a minute down on Dennis, having started strongly. Meanwhile Maciej Bodnar is doing a solid ride, but both riders are set to miss out on the medals. Cancellara grimaces and gets out of the saddle on the steep slopes of the first climb. He takes a hairpin bend at its widest to soften the gradient. And he sets the quickest time! Wow. Cancellara, having been 24 seconds down on Dennis at the last split, is now 18 seconds in front. We thought he may have started to quickly, but clearly not. He has smashed the first portion of this circuit on both occasions. Problem for Dennis! The Australian has a mechanical and shakes his head as he slows down and pulls over. He gets a really quick bike change but that will certainly cost him. Dumoulin catches and passes Kiryienka, who can be counted out here. Dumoulin is third fastest at the third check but he's losing ground to Cancellara. Froome is fourth at the third checkpoint (34.6km). What is his pacing strategy? Does he have more in the tank for what remains of this course? He's fond of a negative split but it looks like the gold medal may just be out of reach here. Cancellara brings it back. Interesting. Carrying his momentum better through corners having big effect in final portion of course. Thomas hits the finish line now and clocks 1:14:52.85 to take the hotseat as the provisional leader. Castroviejo comes across the line and stops the clock on 1:13:21.50 - that's a minute and a half quicker than Thomas. The Spaniard is in the hotseat, but will it be enough for a medal? Cancellara consolidates his lead, thanks in part to Dennis' mechanical. The 2008 champion is now 53 seconds up at the fourth checkpoint (44.4km). Bodnar sets the second fastest time but it won't be good enough for a medal. Tony Martin is 10th and nearly three minutes down at the fourth checkpoint. The doubts over his form have proved accurate, though this hilly course was always going to be tough for the German. Dumoulin comes to the fourth checkpoint 27 seconds down on Cancellara. He's not losing much ground but neither is he gaining any. In any case, he's now above Dennis in the virtual standings. Chris Froome is coming back. He is now third, and overtakes Dennis, who had that bike change. Froome has a medal in his sights. Cancellara is in the closing phases of his ride, and he is on for a second Olympic time trial gold medal. What a result this would be in his final season - a final season which hasn't until now followed the romantic script he had written for himself. Dennis finishes his time trial and he's 4 seconds slower than Castroviejo. It's not to be for the Australian. Cancellara crosses the line now and he's 1:06 quicker than Castroviejo. He's in the hotseat atop the leaderboard - and commandingly so. Over to Dumoulin and Froome, but what a ride from Cancellara. What can Dumoulin do here? It doesn't look like he's making up enough ground, and neither is Froome, who is now nearly a minute down, according to the virtual timings out on the road. This looks like a race for silver now between Dumoulin and Froome. Cancellara surely has it. Taylor Phinney crosses the line after a disappointing ride. The same goes for Tony Martin, who finishes well over 3 minutes down on Cancellara. The Dutchman goes into the silver medal position, 47 seconds down on Cancellara. Just Froome to come in now. Silver looks out of his reach but bronze is in danger due to Castroviejo. Froome takes bronze. The same as four years ago in London. He beats Castroviejo by 4 seconds. He leaps up from the hotseat and celebrates wildly with his entourage when he learns of Froome's time. What a famous victory. Poor @jcastroviejo. 3 sec from the bronze medal in Richmond last year and now 4 sec from bronze in Rio. Ai ai ai... Still impressive tho! Froome shakes his head as he takes off his helmet but then shares a warm handshake with Cancellara, who was simply too good today. Fairy tale ending for an incredible career @f_cancellara. Beautiful to watch. What a way to end your career. Forget the near miss at the Tour of Flanders, the crashes at Paris-Roubaix, the illness that possibly cost him the pink jersey at the Giro, and everything else that hasn't gone to plan. This has. What a fitting final chapter in one of the most remarkable careers this sport has ever seen. Cancellara soaking it all in from the hotseat (hot sun lounger) ahead of the podium ceremony. Here's Geraint Thomas' reaction after his 9th place. "It was a fight all day. I didn’t feel good but I gave it everything but it wasn’t to be. "I had a McDonald’s with the road boys on Sunday but Usain Bolt has McDonald’s so I thought why not. I found out about 10:30 on Monday night. It was a late call-up but there’s not much I would have done differently. I got stuck in and gave it everything but it wasn’t my day. "It’s been… like you say, the disappointment of the crash overwhelmed everything else but once you have a few days to reflect on it all, it’s always great to go to an Olympic Games and represent Great Britain and be in the village. It’s my third Olympics, unfortunately it didn’t go how we wanted but we can still be proud that we gave it everything and that’s the way it goes sometimes." Armstrong, 42 years of age, cracks a grin and tries to hold back the tears as the gold medal is placed around her neck. The US national anthem begins to play, though, and the floodgates open. The heavens open once more as we wait for the men's podium ceremony. Cancellara stands out in the rain in front of the podium step, but UCI President Brian Cookson, there to help present the medals, has someone holding an umbrella under him. Cancellara skips onto the podium and jumps in the air, waving his arms with youthful exuberance. No tears for Cancellara as the Swiss national anthem plays, but he has a wide smile that can't be removed. He's enjoying every moment of this. And now we hear from the bronze medallist, Chris Froome. "I can’t be disappointed with that. Of course I would have liked to have been in with a chance of going for gold but I gave it everything that I hadtoday and at the end of the day I have to be happy with that. "Fabian, he was the clear winner today. He was more than a minute ahead of me. I think if I’d lost by maybe five or six seconds then I might have been disappointed with myself but Fabian was clearly the strongest guy today. I don’t know what else to say, I gave it everything I had. I tried to hold back for the last lap but I just didn’t have any more. "It’s an amazing feeling, the year that I’ve had. With the third Tour win and to come here and medal again for the second time at the Olympics is just incredible. I just want to thank everyone who has been a part of this, most notably David Rozman who has been looking after me this year, Tim Kerrison my coach, and Team GB." And now Cancellara speaks, sharing his thoughts on his gold medal. "It’s pretty special, I still don’t really have the words. After the disappointment in 2012, and many other up and downs that I’ve had, and this is my last season, it’s my last Olympic Games and my last chance to do something. "I knew that it was going to be a tough day, a challenging day with Chris Froome, Tom Dumoulin and all the others. It was an open course for all different characteristics. I have no words. Finishing after 16 years, with the gold, it’s not bad." "Not specifically. We looked at it with the trainers and the team manager, we worked hard and even yesterday I had my doubts. I think it was good doubts. I saw myself but all around me I saw different Fabians, with questions about this and that. In the end, I found a way to focus on what I needed to do and this was not to go too fast at the beginning because over an hour, you have to balance everything right. I balanced if well in the first lap and I knew that I had to do that. I found a good key to go well over the whole day and now I’m just happy." That's it for our live coverage for today. What a day of racing - we hope you've enjoyed it. We'll leave you with our full report from the men's TT, and with this shot of Cancellara with his gold medal.